Manchester United midfielder, Ander Herrera, has cast doubt over his future after he said he and the club “are not thinking alike”. Speaking with Diario ABC, the Spaniard also said Paul Pogba would be a suitable fit at Real Madrid. 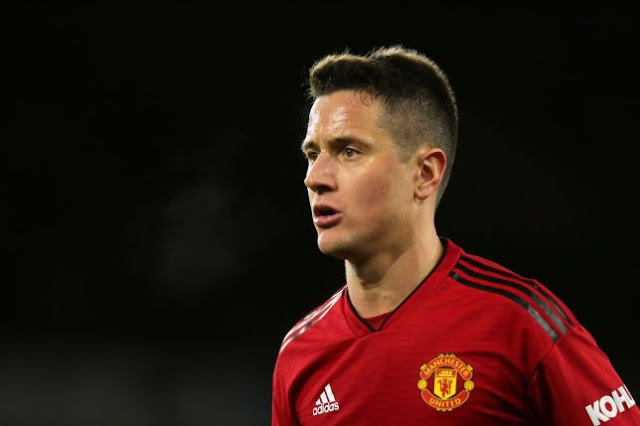 Herrera, 29, will be out of contract in the summer and Paris Saint-Germain, Arsenal, Barcelona, Juventus and Inter Milan are interested. And, speaking ahead of the Champions League quarter-final first leg against Barcelona, he said he and the club are no nearer reaching an agreement. “What I want is to beat Barcelona and think about football. “It’s true that I only have two months left on my contract and as it is right now Manchester and I are not thinking alike and there is no renewal agreement. “But my duty is still to continue to listen to United. What it’s clear to me is that I will continue playing for a big team. I take care of myself for that reason, I feel well and I want to continue in football for as long as my body allows me to because the day I retire I will begin to regret to have hung up my boots. “I will listen to United, of course, but also to other clubs. I don’t close any doors,” he said. Asked about whether Pogba would fit in at Real Madrid, Herrera added: “Pogba would be a great reinforcement for Madrid and for any team in the universe, but I hope he continues at United.